Seamless contained development and manufacturing reached with Perfima, IMA Active’s top-level technology for coating. «We believe the world would be a healthier place if tomorrow’s medicines were made available today». Much more than a declaration of intent, this is the mission of Patheon, a leading provider of contract development and commercial manufacturing services. From over forty years, Patheon has been transforming the way pharmaceuticals are made with a simplified, end-to-end supply chain solution for pharmaceutical and biopharmaceutical companies of all sizes. The Company’s comprehensive range of services, spanning all phases and scales, is wider and deeper than that of any other CDMO. Drug substances and drug products; small and large molecules; sterile, oral solid and softgel dosage forms are all within Patheon’s portfolio. Patheon’s global leadership is built upon a reputation for scientific and technical excellence. This includes specialized capabilities for highly potent and controlled substances, aseptic filling and lyophilization, complex formulations, solubility enhancement and difficult to manufacture APIs. The site in Bourgoin, France, dating back its accomplishments to 1960, is authorized by the FDA to handle safely APIs processes with a minimum OEB4/OELs > 10 ng/m³ (Cat 3b). Patheon Bourgoin is focused on solid oral dosage manufacturing, utilizing compatible processes to allow smooth process scale up from clinical batches and small commercial batches (1-150 kg) to larger commercial process scales (150-750 kg). Contained processing is utilized to minimize the need for personal protective equipment (PPE) for routine operations. In 2012, IMA and Patheon began the initial stages of the cooperation by planning and scheduling the preliminary tests in the IMA Active Process Laboratory to test the performance of IMA coaters. Trials were conducted on both pilot and production coaters (Perfima Lab – drum 40 L and Perfima 200 – drum 250 L) to test and scale up process conditions by using the parameters reported in Table 1. The objective of the trials was building together the base and the knowledge of one product that Patheon need to process on the production coater Perfima 500 located in Bourgoin using high potent cores and a similar coating agent. Process parameters are reported in Table 2: no significant obstacles were encountered during scale up activities; final coating quality results were optimal in both coaters. After this initial trials were completed in the lab, the commissioning and installation phase of new coater was organized and completed and process with the high potent API needed to be performed with the larger coater Perfima 500 (drum 650 L) installed in Bourgoin. Base parameters were identified by Patheon in a development step in a Perfima Lab (drum 70 L) installed at the Bourgoin site. The IMA and Patheon teams considered the target an easy challenge due to the optimal performances achieved on the pre-validation batches in the Perfima Lab (drum 70 L) installed in Bourgoin. Unexpected obstacles were found when process parameters were transferred to the larger Perfima 500 since in such a different pan size the behavior of the tablets changes significantly. Because of poor cores geometry mainly, many of the preliminary batches were not complying with the AQL standards due to edge chipping and coating erosion defects: tablets provided two preferential area of contact with the coater and were subjected to erosion in those positions. Tablets characteristics are reported in Table 3. Process parameters ranges used in Perfima Lab (drum 70 L) are summarized in Table 4. The process was transferred onto the Perfima 500 in containment mode meaning no possible contact of operator with product. The main challenge came from the fact that almost all process parameters were already filed and fixed except for pan speed, atomization pressure and gun distance (thermodynamic parameters could not be changed). 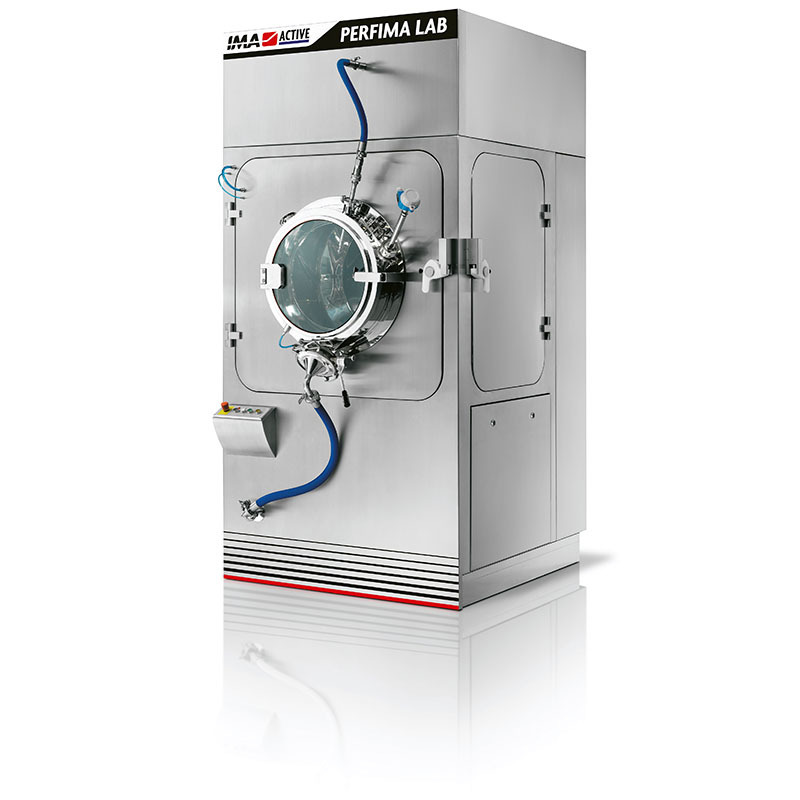 First, it was necessary to adjust a few changeable settings: once optimized the sampling procedure through sampling thief and fixing the loading and preheating step in soft jogging way the main parameters obtained on a Perfima Lab (drum 70 L) installed at customer in the R&D facility were up-scaled systematically. To do this an IMA process technologist, all customer specialists and Colorcon technical staff shared all their expertise together in order to achieve the results in the space of a couple of tests. It was necessary to come in direct contact with the process very often so it was decided to bypass the containment safety system and for this reason, it was decided to work a placebo having 100% similar characteristics with the API tablets. Only two tests were necessary to achieve the AQL standards (only 4 defects on 1,250 tablets), and pan speed and gun distance were identified as crucial parameters to solve the problem. Pan speed was decreased to reduce the stress on the tablets surface and gun distance and orientation was kept around 20 cm to coat and protect the tablets surface quickly and avoid cores erosion, best orientation of guns was found with 90° guns angle to cores bed. This strategy led to very good coating quality in less than 90 minutes spray time. Process parameters ranges used during spray step in Perfima 500 are summarized in Table 5. During validation batches it was crucial the cooperation between IMA, Colorcon and Customer to achieve AQL standards. In particular, it was possible to solve coating defects such as edge chipping and cores erosion even if all main parameters were already filed. 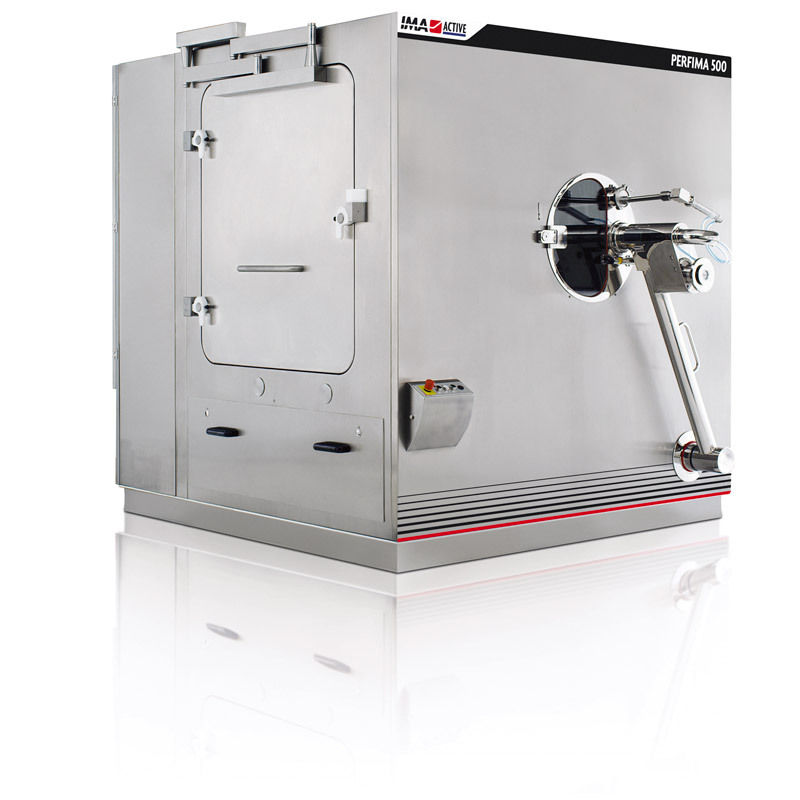 Adjusting loading and unloading procedure, pan speed at 5 rpm and gun distance at 20 cm at the beginning of the process and 23 cm during the end enabled to overcome all coating defects encountered during pre-validation batches.